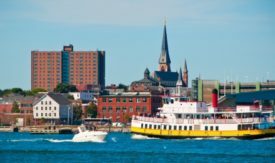 Maine & New England 2019 | Senior Adult Travel Inc. The Trenton Departure on September 21 has gone to a Waiting List! But because of the interest and excitement, another departure is scheduled for Gainesville!! Motorcoach transportation, 8 nights lodging including 4 consecutive nights in Maine, 6 dinners, all admission fees, and much more. Depart in a spacious, video and restroom equipped motorcoach and set off on your exciting trip! Tonight, settle into a comfortable en route hotel for a good night’s rest. Visit the Petersburg National Battlefield Park in Virginia. Later in the day, enjoy Dinner and check into your en route hotel. Arrive in beautiful Maine! Later that day, enjoy a relaxing Dinner and check into your accommodations in Maine for a four-night stay. Enjoy a Continental Breakfast before departing for a Guided Tour of the seaside city of Portland. 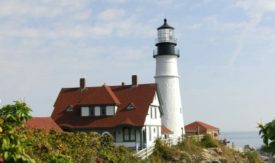 View Longfellow’s boyhood home and sea captains’ houses, and stop at Portland Head Lighthouse, the most photographed lighthouse in America. Enjoy free time at the historic Portland waterfront, home to unique shops and eateries. Next, tour Victoria Mansion, an elegant historic home featuring spectacular architecture, stunning interiors, and exquisite, original furnishings. This evening, enjoy Dinner with entertainment. Enjoy a Continental Breakfast before departing for a Guided Tour of picturesque Pineland Farms! This beautiful rural landscape houses a working farm. Visit the Holstein Dairy Barn with your guide, and see the award-winning dairy cows. Next, go to the creamery and watch the award-winning cheese being made before your eyes. Shop at Pineland Farms’ Market, offering Maine-made gifts and gourmet food. Next, explore Boothbay Railway Village, featuring 28 historic structures. You can take a ride aboard the Narrow Gauge Steam Train, marvel at the antique auto exhibit, see an immense model railroad exhibit, authentic boxcars, and much more! Then continue on to Dinner. 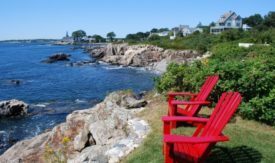 Today, after a Continental Breakfast, enjoy a Guided Tour of the Maine coastal villages of Kennebunk and Kennebunkport. See Dock Square in Kennebunkport, and follow Ocean Avenue along the Atlantic Ocean. Drive by the estate of President George H.W. Bush at Walker’s Point, and see the coastline comparisons of Kennebunk beaches. Explore the gardens and shrines of the Franciscan Monastery. During free time, visit the quaint shops and eateries in downtown Kennebunkport. Next, visit the Seashore Trolley Museum, where you can enjoy a trolley ride on an authentically restored streetcar through the Maine countryside. Later, enjoy a Lobster Dinner, and then visit the L.L. Bean flagship store. Enjoy a Continental Breakfast before leaving for the Boott Cotton Mills Museum in Lowell, MA. Later that day, after a relaxing Dinner, you’ll check into your en route hotel. Today you will have Continental Breakfast and then go to the National Harbor, a unique waterfront wonderland of shopping, dining, and more. Tonight, relax in your en route hotel. After enjoying a Continental Breakfast, you depart for home. Talk about the great sights you’ve seen and where your next group trip will take you!